UBC researchers have discovered a universal electronic state that controls the behavior of high-temperature superconducting copper-oxide ceramics. The work, published this week in the journal Science, reveals the universal existence of so-called 'charge-density-waves' -- static ripples formed by the self-organization of electrons in the material's normal state. 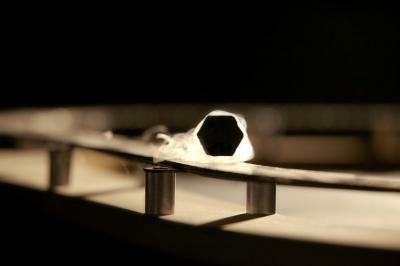 These ripples carry the seeds out of which superconductivity emerges. "Our understanding of superconductivity in the cuprate family has been hindered by the diversity of intertwining electronic orders," says UBC PhD student Riccardo Comin, lead author on the paper with colleagues at UBC's Quantum Matter Institute, the Max-Planck-UBC Centre for Quantum Materials, and a consortium of research institutions in Canada, the United States and Japan. "These new findings suggest the existence of a universal charge-ordering that is common to all cuprate materials, and uncover its connection to the emergence of superconducting behavior." The work also proves that researchers can interchangeably use two techniques -- resonant X-ray scattering or scanning tunnelling microscopy -- to probe the mysteries of charge-density-waves. "These are fundamental, but very subtle, features which leave only a faint spectroscopic fingerprint," says UBC professor Andrea Damascelli, leader of the research team. "The success in detecting these tiny ripples in the electron distribution demonstrates the far-reaching power of these complementary techniques, and their pivotal role in advancing our understanding of quantum materials." Superconductivity -- the phenomenon of electricity flowing with no resistance--occurs in some materials at very low temperatures. High-temperature cuprate superconductors are capable of conducting electricity without resistance at record temperatures, higher than the boiling point of liquid nitrogen. Because of their unrivaled characteristics, they represent the best candidates to advance current superconductor technology, which includes a broad range of applications such as: quantum computers, MRI, high-precision magnetometry, levitating high-speed trains, and lossless power lines.